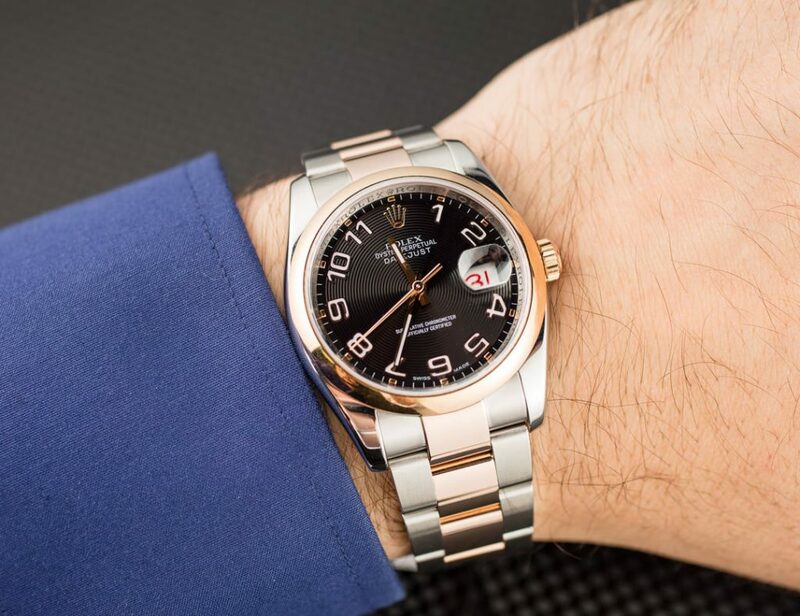 One of the reasons that Rolex watches are so recognizable is that the company has retained the basic shape and structure of their watches throughout its history. Aside from design tweaks and movement improvements, a Submariner today looks very similar to the ones from the 1950s — as does the Datejust, GMT-Master, Day-Date and so on. So to keep things fresh, one approach Rolex takes is to introduce interesting dial options to their collections. Here we take a look at three examples of the Rolex concentric dials, where repetitive circular patterns add interesting depth to the face of the watch. A straightforward three-hand Rolex timepiece, the Rolex Oyster Perpetual is the ideal entry-level luxury watch. 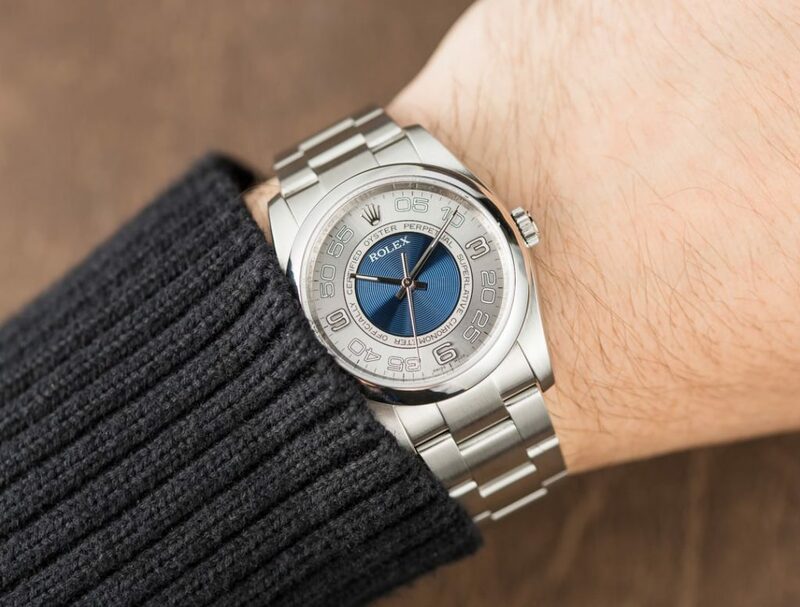 Constructed of robust stainless steel, sized at the traditional 36mm, outfitted with the sporty Oyster bracelet, and powered by a Rolex automatic mechanical movement, the Rolex Oyster Perpetual has everything you need and nothing you don’t. 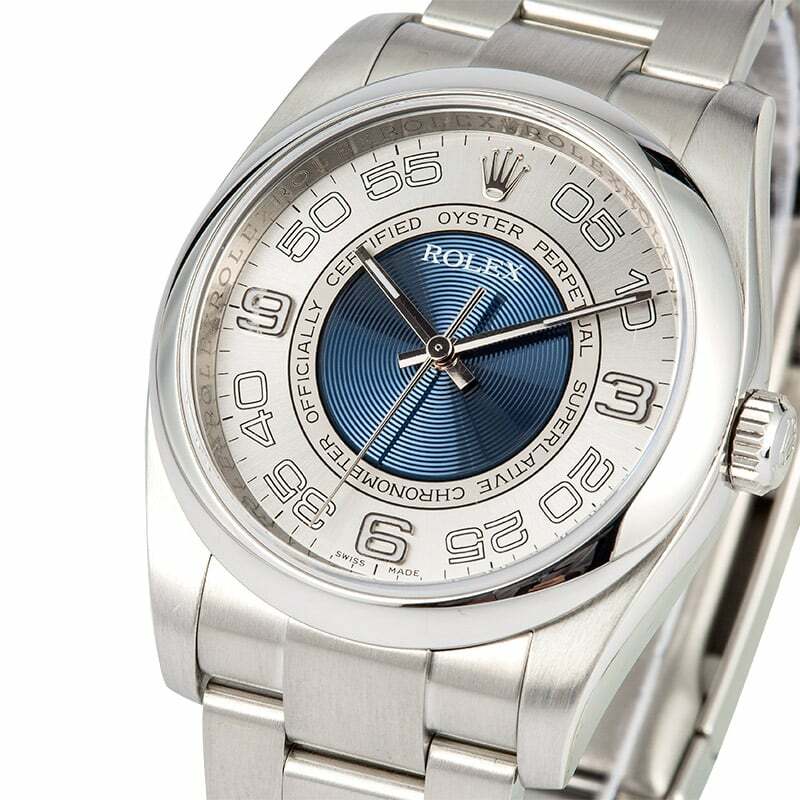 The concentric dial of this particular Rolex Oyster Perpetual ref. 116000 lends character to the look of the watch. 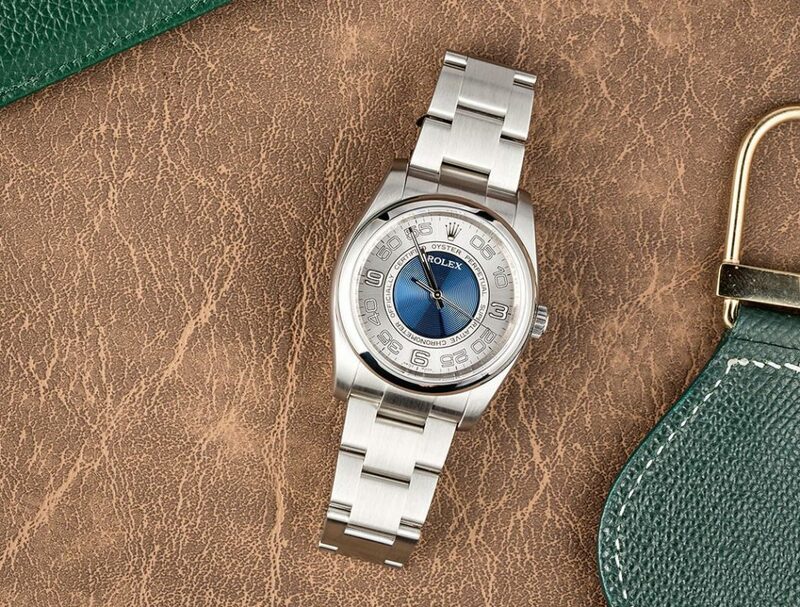 The rich blue circular pattern at the center of the dial resembling a bull’s-eye is encircled by the “OYSTER PERPETUAL” and “SUPERLATIVE CHRONOMETER OFFICIALLY CERTIFIED” labels. The Arabic numerals around the dial include hour markers at 3, 6, and 9 o’clock, while the rest are minute markers. 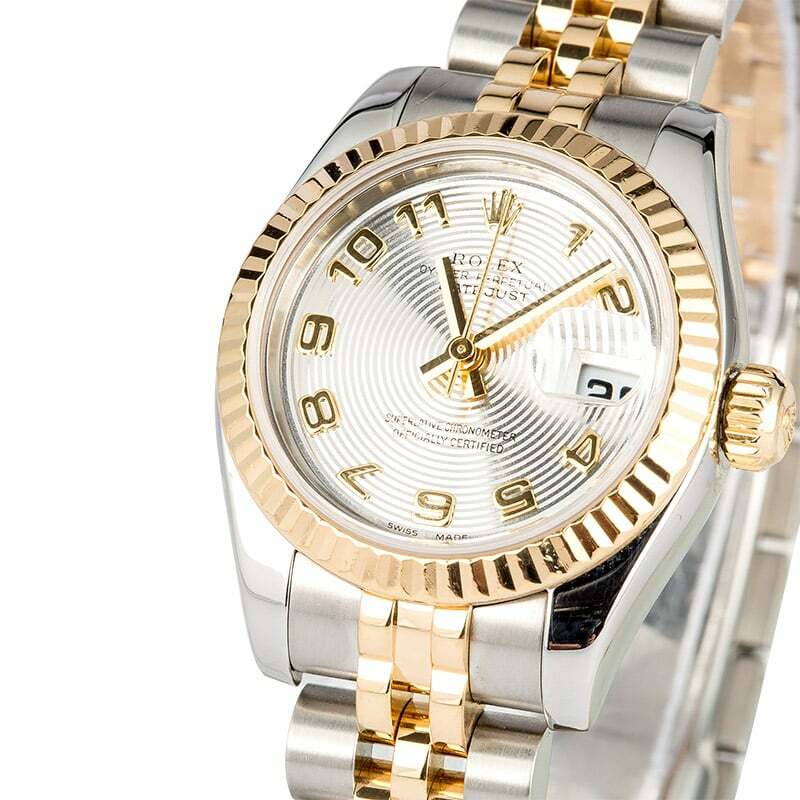 The Rolex flagship model, the appeal of the Rolex Datejust series is its versatility. Although the fundamental form stays the same, the bezel, bracelet, material, and dial options are plentiful. This particular Datejust ref. 116201 is fashioned from a mix of stainless steel and 18k Everose pink gold — dubbed pink Rolesor. The black dial features the concentric motif spanning from the center all the way to the outer track. The luminescent Arabic numerals are outlined with Everose gold to prevent tarnishing and the date window is equipped with the Roulette style date wheel with alternating black and red numbers. 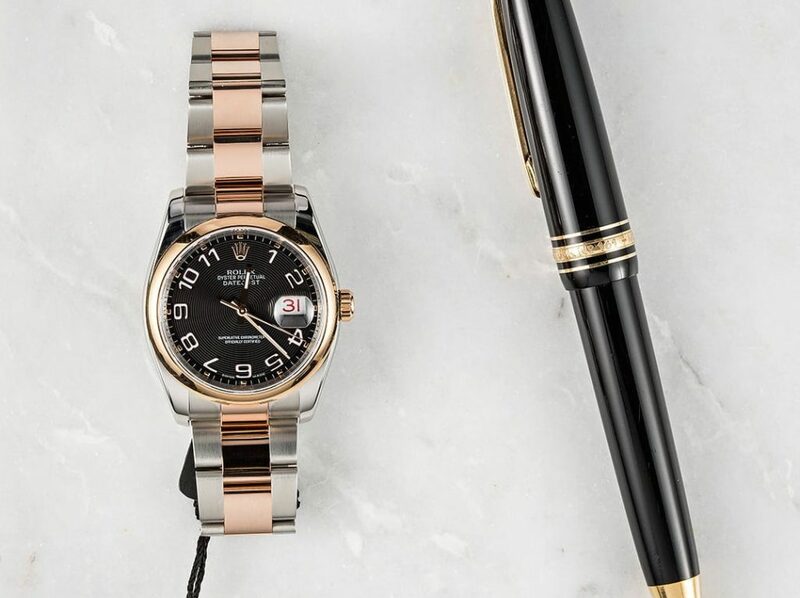 The quintessential lady’s luxury dress watch, the Rolex Lady-Datejust is understood to be the brand’s best-selling model. Cherished for its feminine look, luxurious appeal, and immaculate craftsmanship, the Lady-Datejust is an absolute must-have for any chic woman. 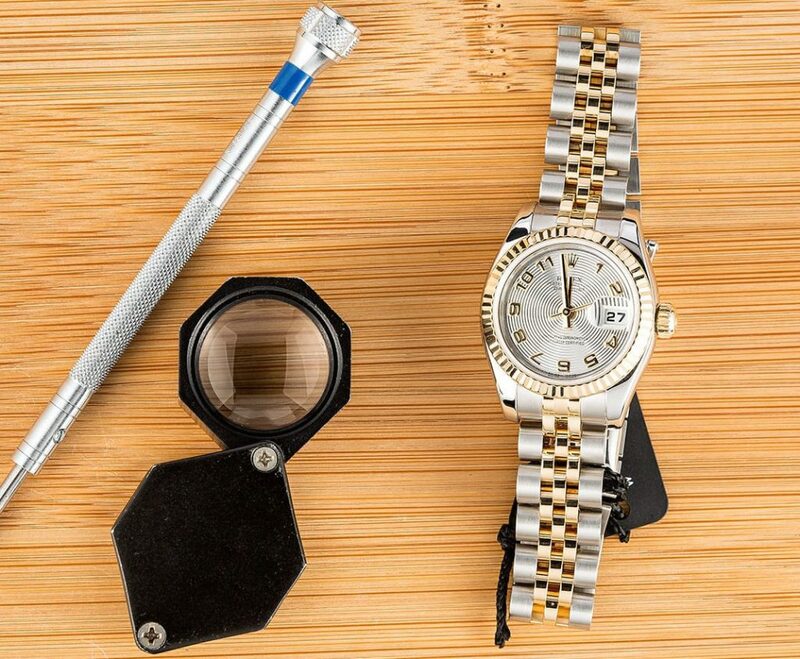 The Lady-Datejust ref. 179173 is sized at a dainty 26mm and combines both stainless steel and 18k yellow gold. This particular yellow Rolesor Lady Datejust is presented on the classic and more elaborate Jubilee bracelet. The silver concentric dial draws the eye in, while the yellow gold numerals and center hands match the yellow gold fluted bezel and winding crown.